Silicon based solar cells are still preferable due to its existing technology with inexpensive fabrication cost. However, silicon solar cells are having drawback of weak absorption in longer wavelength due its indirect band gap and needs efficient light trapping in active region. In this paper, we present a design of solar cells based on top anti-reflection coating (ARC) layer and back reflector which is composed of distributed Bragg reflector (DBR) and diffraction grating (GRA) using finite difference time domain (FDTD) method. Simulations show efficient trapping of photon in active region as comparison to reference solar cell. A relative enhancement of cell efficiency ~54 and 60 % is observed for designed solar cells C2 and C3 respectively. 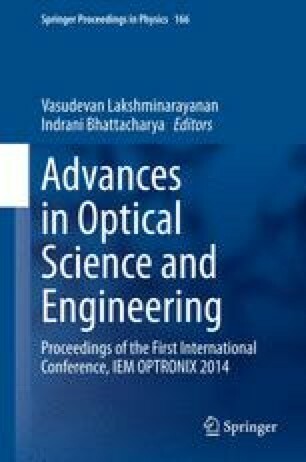 This enhancement in performance of solar cells is attributed to the increased absorption and quantum efficiency in red and infrared part of incident solar spectrum. The financial support provided by Defence Research and Development Organisation (DRDO), New Delhi, INDIA is highly acknowledged.